Quick tooling changeovers for maximum production flexibility. Operator ergonomics considered i.e. 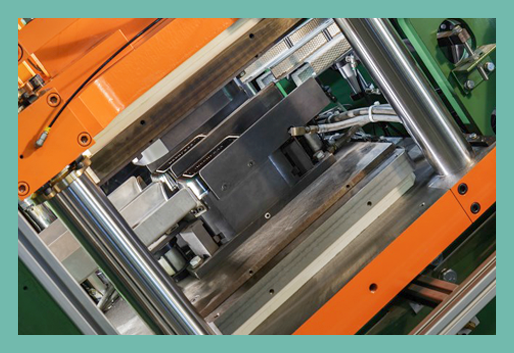 lightweight cut or cut/score dies, internal forming die roller assist system, external forming die removal rack, easy access decurl unit, vertical lift roll stand, et cetera. Vertical lift roll stand incorporating pay out rollers integral to the machine line. 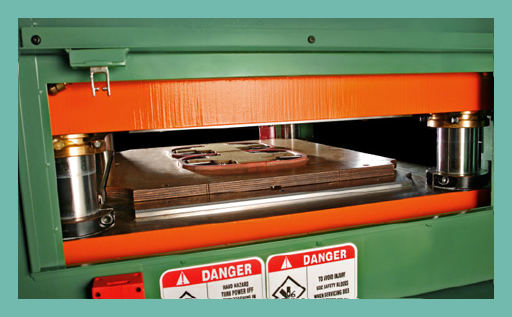 Utilizes steel rule cutting or cutting/scoring to reduce initial die cost and maintenance expenses. Prescored and non-scored product capability. Adjustable forming section dwell and stroke allows machine settings to be tailored to each specific product resulting in optimum quality and production speeds. Maximum blank length 18″ (457.2 mm), dependent on your product geometry. Number wide operation is dependent upon blank size and product geometry. Complete machinery guarding for operator safety. Replaced hydraulic controlled motion with servo driven linear actuators for smooth operation and improved reliability. All tooling is interchangeable between M27T & M27E. New removable cap design and refreshed guarding provide for improved visibility, machine setup, maintenance, and serviceability for pins & bushings. 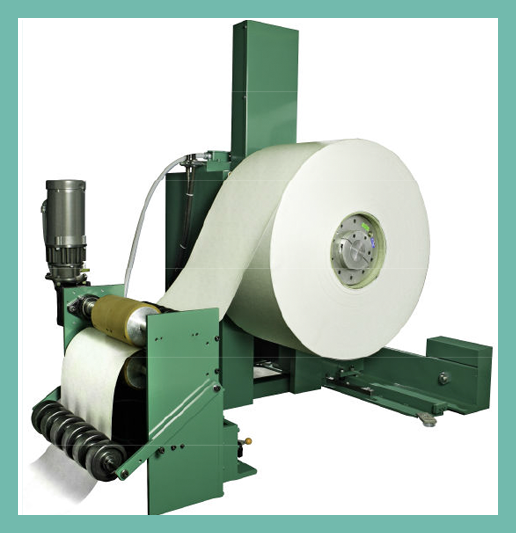 Easy access decurl unit assists in removing up or down curl in the paperboard for smooth and consistent feed ups. Photoelectric eye utilized in conjunction with a servo motor feed drive system results in consistent feed ups and a print-to-cut accuracy of +/-.015” or .38 mm. Precision heavy-duty mechanical toggle system and four pin die set insures accurate, and repeatable steel rule die cutting and prescoring capability. Steel rule cut/score die design utilized for reduced tooling costs and quick die changeover capability. 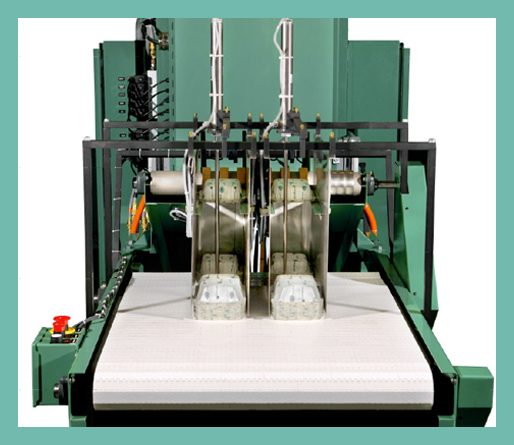 75 tons (665 kN) capacity insures quality die cutting and prescoring for deep draw paperboard tray production. 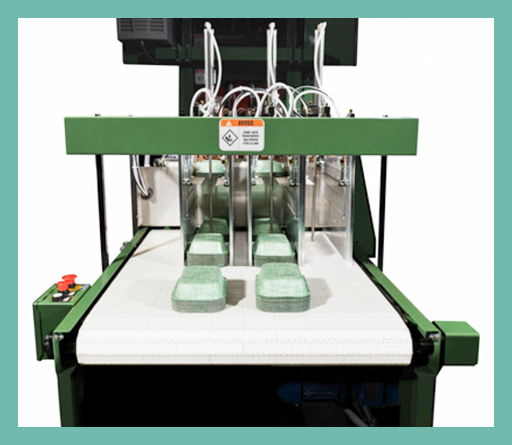 Adjustable forming head dwell and stroke capability allows machine settings to be tailored to each specific product resulting in optimum quality and production speeds. Precision heavy-duty mechanical toggle system and four-pin die set insures accurate and repeatable forming die performance resulting in high quality products. 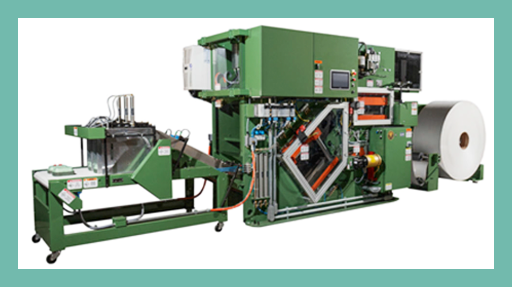 24 tons (210 kN) capacity provides the required pressure for quality forming of deep draw large trays. Forming dies are installed and removed as a set to speed changeover. 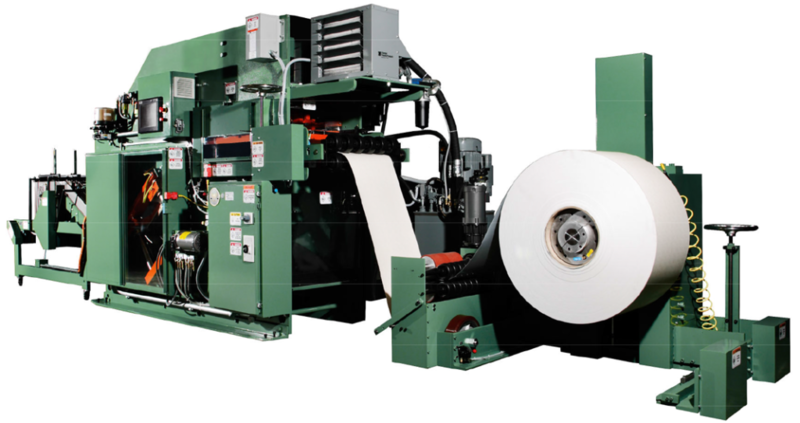 Integral to the machine line incorporating pull roll/dancer arm assembly for consistent tension of the paperboard feeding into the decurl and cut/score sections of the machine. Electrical motor powered screw actuator utilized for vertical lifting and manual hand wheel system used for lateral shifting of paperboard rolls results in quick roll changeover times. Pneumatic or mechanical core chuck assemblies available. Integral to the machine line. Individual belted lanes transfer the formed product from the forming dies into the stacking and counting section. Design allows tall product stacks and offers space for presentation of multiple stacks prior to operator. 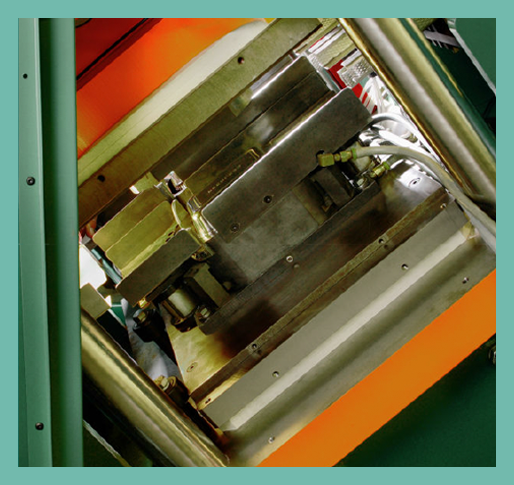 Interlocked guards prevent entrance to the machine when axes are in motion. 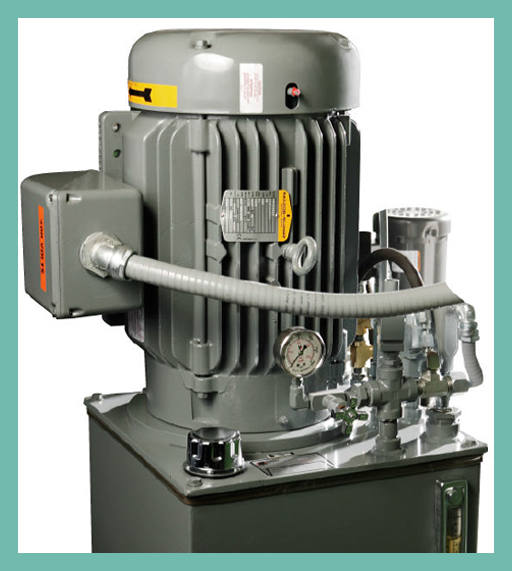 Machine adheres to applicable U.S. and EC safety regulations. P.L.C. 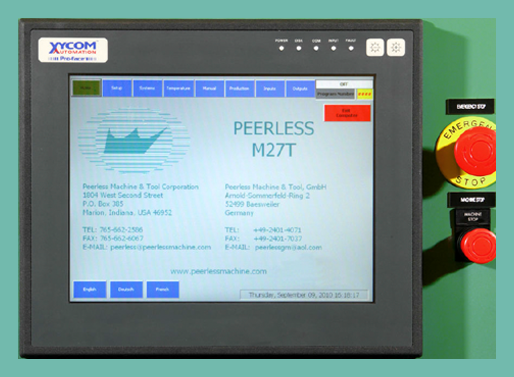 controls support operator interface, temperature, feed, and cut-score/forming motion control. Production programs are easily stored and retrieved. HMI operator interface for 3 axes of digital machine control. Heavy-duty hydraulic cylinder utilized for vertical lifting and manual hand wheel system used for lateral shifting of paperboard rolls results in quick roll changeover times. 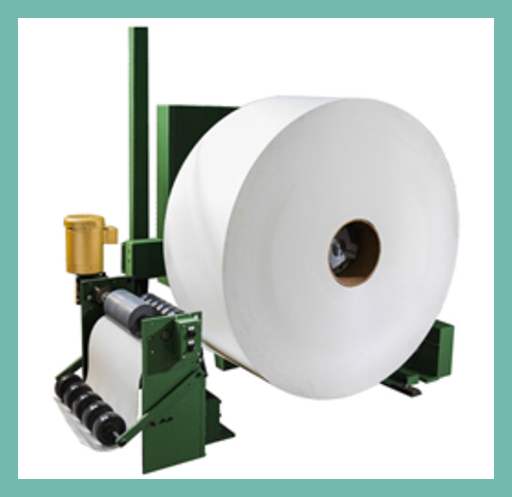 Easy access decurl unit assists in removing any up or down curl in the paperboard for smooth and consistent feed ups. Photoelectric eye utilized in conjunction with a servo motor feed drive system results in consistent feed ups and a print-to-cut accuracy of +/- .015” or .38 mm. Precision heavy-duty mechanical toggle system and four-pin die set insures accurate, and repeatable steel rule die cutting and prescoring capability. 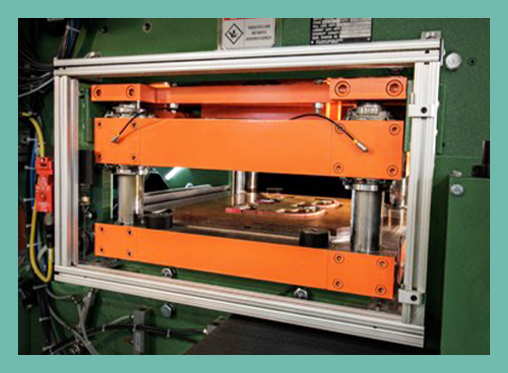 Forming dies are installed and removed as a set to speed changeovers. Compact Unit provides power to roll stand and machine. P.C. 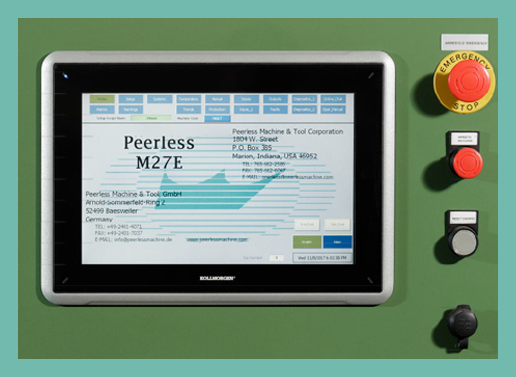 controls support operator interface, temperature, feed, and cut-score/forming motion control. Production programs are easily stored and retrieved. Interlocked guards stop both reciprocating head motions and hydraulic pump motor when opened. All electricals conform to applicable world-wide standards. 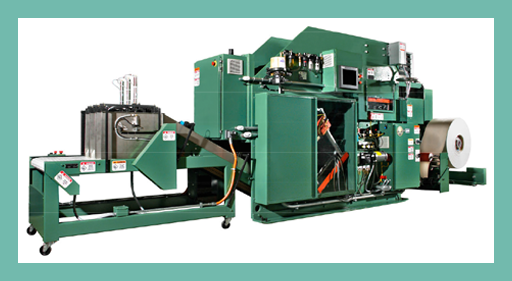 – Distributor to Peerless Machine & Tool Corp.